As a kid, I remember my mother making a pie out of our painted Halloween pumpkin. I thought it was novel because up until that point the only pumpkin I had in pie came from a can. Husband wanted to carve pumpkins for Halloween. I decided to paint my pumpkin and try my hand at cooking it later. I turned that Halloween pumpkin into pumpkin butter! Being a lazy chef, I make pumpkin butter in the crock pot. Being a budget chef, I use the medium size pumpkins we buy as decorations instead of buying a special smaller pie pumpkin. The pie pumpkins are a little sweeter than the larger however; as long as I add the right blend of pumpkin spices, (my favorite pumpkin spice is Trader Joe’s. I buy an extra bottle every October and use it in everything) I have not had a recipe with the larger pumpkin fail the taste test yet. Pumpkin butter is a freezer jam type of recipe. If you are afraid of canning as I was, this is your project! You should not can pumpkin butter because pumpkin is not acidic enough to can and keep properly – which I my mind is another reason to try making pumpkin butter instead of canning jam. 1. Bake and puree the pumpkin. 2. 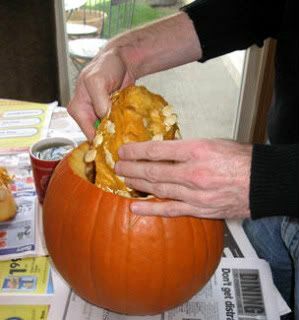 Add 2 Tablespoons pumpkin spice and 4 cups sugar to the puree. 3. Let a cook on medium for 8 hours or over night to reduce the liquid if your pumpkin has a lot of water content. 4. 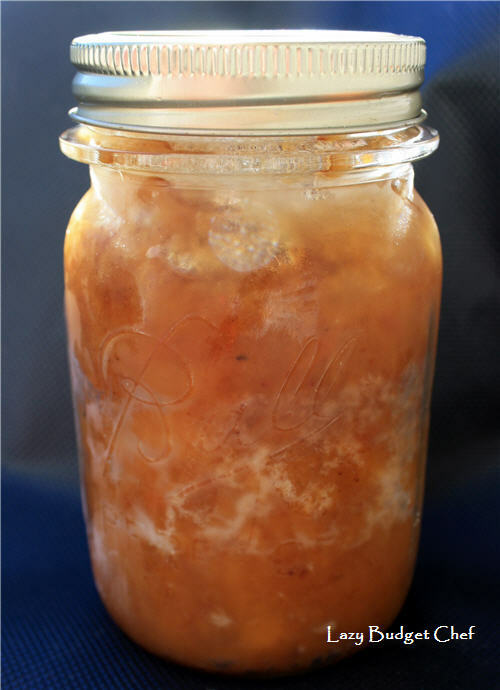 Ladle the pumpkin butter into clean sterilized jars. Leave approximately ¼ inch of room from the filling to the lid of the jar for expansion in the freezer. 5. Wipe excess pumpkin butter from the outside of the jar. Cap the jar with the lid to fingertip tight. 6. Allow the pumpkin butter sit at room temperature for 24 hours. 7. After 24 hours, place the jars in the freezer. I got about 10 jars of pumpkin butter out of one medium size pumpkin. Having so many jars of pumpkin butter in my freezer saves my bacon when I need a quick holiday hostess gift. I grab a jar from the freezer, make a recycled magazine bow for the top and I’m good to go. Fantastic recipe! Going to have to do this one. I was making apple butter anyway so this will have to be next! Thanks for posting it. If you have time come on over! I too posted a recipe this week for Tasty Tuesday. I was wondering if this can be pressure canned? I would rather not use my freezer space for jams and butters? Anyone quess about how long if so? Lucinda - The canning people I checked with (Ball and my local extension office) said pumpkin shouldn't be canned at all. I've never heard of pumpkin butter, but it sounds good! Thanks for the recipe! So glad you linked up with us! Hope you're having a great weekend!